Bristol Disability Equality Forum started as a community group set up by Bristol City Council in 1994. They did this so they could consult Disabled people on how to improve disability equality in Bristol and remove barriers to inclusion. As we developed we set our own priorities, rather than just responding to the Council’s priorities. We became more proactive and, in 2009, our members voted to become independent of the Council. Now we are a very active and effective independent charity. 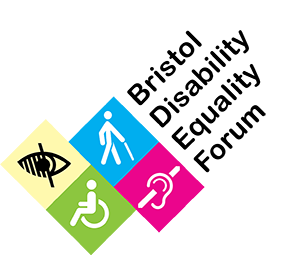 We are an organisation of Deaf and Disabled people, for Deaf and Disabled people where all decisions are made by Disabled people. All Deaf and Disabled adults who live, work or study in Bristol and the areas immediately surrounding it, can be a member. Anyone who does not identify as a Disabled person, or lives outside our membership area, can become an Associate member. These members can attend meetings, get information and join in discussions. The difference is that only full members can vote on decisions about the Forum. The Social Model of Disability is part of everything we do. This means that while we recognise and value our differences and impairments, we believe that we are disabled by the way society is organised – its attitudes towards us, and the barriers it creates for Disabled people and to them living independently. We know many Deaf people don’t see their deafness as a problem and so don’t think of themselves as Disabled. However, we see Deaf people as part of our community because it is society that disables us, not our bodies. Therefore, to us, Deaf people are a linguistic minority and Disabled people. experience of repeated mental and emotional distress. Some were born with impairments, others have become Disabled; some have visible impairments and some have hidden impairments. All of them are welcome. We have always been funded by Bristol City Council. However, this is due to end on 30th April 2018. In recent years we have also started to earned income from contracts and research, as well as getting a small amount of funding from charitable trusts. We now need to grow our income from donations, as well as from grants. This would enable us to do more of the work our members want us to be doing that it is difficult to get funding for. So, please do think about supporting us and visit our Donate page.